Stuffed Acorn Squash – Nutrition.Health.Life. It is that time of year that we all love (or at least I do) – squash season! Squash is by far the easiest vegetable to cook. It can be daunting but believe me, it couldn’t be easier. Especially acorn squash. I usually like to pair spiced items like apples, cinnamon, wild rice, and ground beef with acorn squash and savory things like Parmesan cheese, sage, and spinach with butternut squash, but that’s just me. This dish was just using what we had on hand that sounded like a good combination. J just started a new job and took this for lunch during his 2nd week. He got so many, “what is that?! ?” comments. Most of them where shocked that you could use squash as a bowl. Oh men, where is your creativity? Oven Option: Preheat the oven to 350F. Line a baking sheet with foil and spray with nonstick cooking spray. Slice the squash in half and scoop out the center contents. Place face-down on the foil-lined pan. Bake for 25 minutes, or until the flesh of the squash can be easily pierced with a fork. Microwave Option: With a sharp knife or fork, carefully poke all over the squash. You need to get deep enough that the holes go to the center/open portion of the squash. Place the poked squash in a microwave-safe glass dish. Place a tiny bit of water in the base of the dish and cover the dish with plastic wrap. Microwave on high for 7-10 minutes. Let stand in the microwave for 3-5 minutes and then remove. Test doneness by trying to pierce the skin with a fork. Cut the squash in half. Prepare the filling while the squash cooks. Spray a large skillet with cooking spray. Add the onion and beef. Saute for 5 minutes. Add the chopped carrot, almonds and saute for 5 more minutes. Mix in the cooked rice. Season to taste. Fill each half with the prepared filling. Wrap with plastic wrap and refrigerate if you aren’t eating it right away. To reheat, keep the squash wrapped in plastic wrap and microwave on high for 3 minutes. 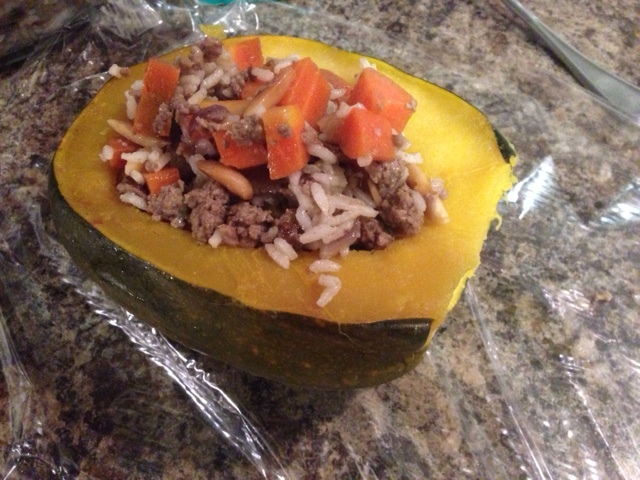 This entry was posted in Nutrition and tagged Beef, grains, nuts, squash, vegetables. Bookmark the permalink.